iDid: Meeting Radar : iDid Inc.
Meeting Radar is another automated location sharing function of iDid. 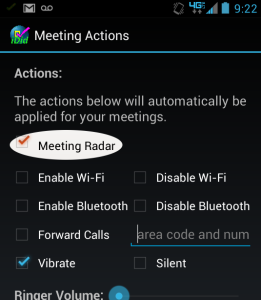 When you turn this feature on it automatically shares location information among upcoming meeting attendees. A persons location is plotted on a map with traffic overlay, so if someone is running late that information is available to other attendees. With this feature you are no longer distracted trying to compose a “running late” email while driving and presumably in a hurry. Not to mention you often can’t guess ETA due to traffic and end up sending that email multiple times. iDid knows when there’s value in sharing location and does that. Once the reason goes away, sharing is stopped. Simple contextual automation. To use this feature select the calendars that you would like iDid to scan in your Meeting Actions settings. Then check Meeting Radar. That’s it!